I just read this article and thought you might want to give it a read, too. It\'s called Azerbaijan is the coolest country you’ve never heard of and you can find it here https://www.orbitz.com/blog/2016/07/azerbaijan-is-the-coolest-country-youve-never-heard-of/. Azerbaijan is one of those destinations that makes you wonder why you didn’t visit sooner. It’s at the crossroads of Europe, Asia, Russia and the Middle East, with the flavors of all four (but especially Europe) blended into its architecture, cuisine, handicrafts and traditions. 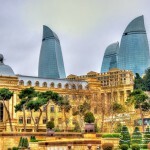 Baku, the capital city, has been called the “Paris of the Caucusus” for its broad boulevards lined with Beaux Arts buildings and fountains, and mile-long walkway along the Caspian Sea which is as popular for strolling as the Seine. The country’s vast oil and gas reserves have made it an important international trading capital for more than a century, and oil and gas are fueling modern architecture, as well. Baku’s skyline is dominated by the Flame Towers, a trio of curved office and residential towers lit at night with a neon display of flames and other kaleidoscopic patterns. One of the best places to watch is from the terrace of the Palace of Shirvanshah, which dates from the 15th century. This limestone Palace is part of Baku’s ancient Walled City, a UNESCO World Heritage Site and one of thelargestwalled cities in the world. About half the palace’s 47 rooms and vestibules are open for touring. The Throne Room has magnificent ancient furnishings and a tile-domed ceiling. The furniture and carpeting are real, but the intricately patterned tiles are via high-tech virtual reality imaging. Also within the old city walls is The Maiden Tower, worth climbing for its picture postcard view of the city and Caspian Sea. It’s also called the Virgin Tower, in honor of the daughter of the 12th century king who built it. She threw herself off rather than marry the man her father chose for her. Baku was a stop along the ancient spice trading route, and the old Caravansari was where camel caravans rested and refreshed. The outdoor courtyard now houses restaurants and cafes, and the surrounding rooms are shops. Mangal, at Boyk Gala 17 in the Old City, has a traditional restaurant on one side, and a modern one on the other. Women bakeflatbread on griddles, while men handle the open-fire grills, for both. The National Museum of History is in an 1883 Renaissance-style mansion, the former home of an oil baron. Displays include Stone Age pottery and tools, medieval chain mail, mannequins in a variety of traditional regional dress, and a section showcasing Azerbaijan’s Jewish history, including an 1852 Torah from the Ukraine (despite being more than 90 percent Muslim, this secular nation has strong Christian and Jewish communities). The National Carpet Museum looks like a rolled-up carpet outside. Inside, hundreds of finely made carpets in complicated patterns line the curved walls over two floors, along with samples of incredibly detailed cloth embroidery. Artisans also work on looms to show visitors how it’s done. The undulating and dramatic all-white Heydar Aliyev Center, named for the founderof modern Azerbaijan, includes an exhibit on the country’s history, art galleries and a concert and conference hall. It was designed by the late Iraqi-British architect Zaha Hadid with one glass-walled side that catches sunlight to illuminate the galleries with natural light. Martyr’s Avenue is a monument to the slaughter of nearly 150 civilians by Soviet troops in 1990, demonstrating against a territorial invasion. It wasn’t the first time Russia has claimed Azerbaijan. The Bolsheviks seized it in 1917, and the country did not regain independence from the Soviet Union until 1998. Independence Day, October 18, is celebrated nationally with traditional music and dance festivals. Food here isinfluenced by all its geographic neighbors and history, including Persian, Ottoman and Greek, and since the country grows nearly all its own food, everything is literally farm-to-table. Restaurant meals are nearly always served family style, with huge platters to share. Lamb kabobs and kofta (lamb burgers) are on every menu, along with miniature rice-stuffed grape leaves. Be sure to try plov, a rice pilaf dotted with bits of plums, apricots, raisins, cashews and lamb. Azerbaijan means “land of fire” in the Azeri language. The country likely was named for Yanar Dagh, or Burning Mountain, 20 miles northeast of Baku. There are constant flames from gas escaping from fissures in the earth. But unlike a fiery volcano, there’s no spewing rocks or flowing magma. If you want volcanoes, the Azerbaijan version is all mud. Nearly half the world’s mud volcanoes are a few miles south of Gobustan National Park, an hour’s drive from Baku. Nearly 400 bubbling mud pots have formed a grey moonscape that looks like it was created by a mad potter throwing giant blobs of clay. 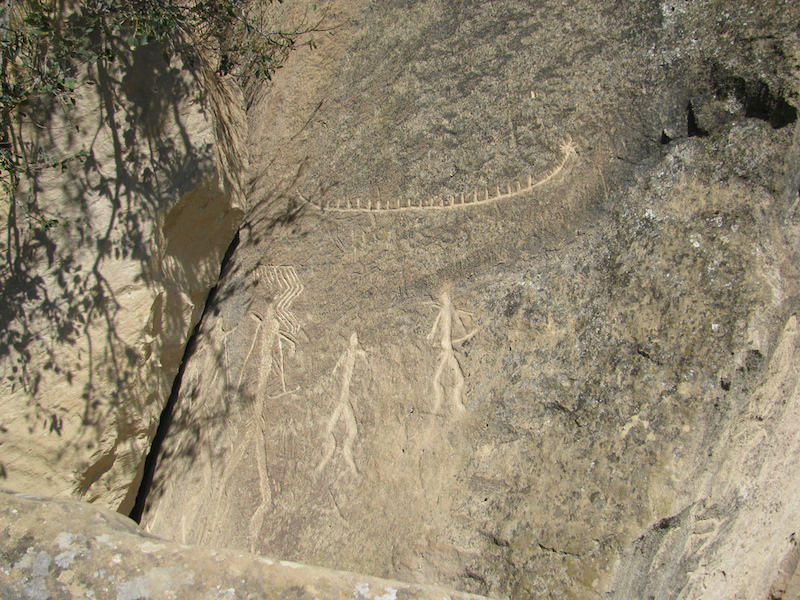 Gobustan is famous for its petroglyphs, or rock art drawings, dating back some 40,000 years, with figures depicting dancing, hunting and animals. The rocky landscape will be familiar to James Bond fans: it was the location for one of the chase scenes in Once is Not Enough. There’s also a small museum in the park. More than 50 grape varieties are grown in Azerbaijan, with dozens of small, family-owned vineyards in the foothills southeast of Baku. Some have been producing wines since the 16th century, founded by the Shirvanshah ruling dynasty. You might want to spend more than a day here, because the closest area is 100 miles from Baku. There are two wine routes, the northern one ending at Balakan skirts the Russian border. Azerbaijan requires a visa, which can be applied for electronically. Conveniently forget to mention that it’s an authoritarian dictatorship that imprisons its own civilians and rattles sabres at its neighbors. You’re much better off going to next door Georgia or Armenia. Better food, more to see, friendlier people. P.P.S Georgia is pretty cool, too! Every Azerbaijani related article should have some fool trying to defame the country, so Armenia is not authoritarian dictatorship? it is basically an enclave of Russia! What is to see in Armenia the old Soviet decaying buildings or oligarchs villa on top of the mountain? my friends did a tour of Caucasus last year and have been to all three cities and Yerevan is a standard old rugged decaying Soviet City nothing more and nothing less! It is quite sad to see a comment like this, especially when the information provided by this user is not entirely accurate. I agree that its an authoritarian regime, however saying that Armenia or Georgia are any different is quite ignorant. In fact Azerbaijan practices a wider freedom of press and expression than any of the neighbouring countries in the last few years, and I say it as a person who has lived in both Azerbaijan and Georgia. The only difference is that Azerbaijan is becoming more prominent in global politics which shines the spotlight on them a lot more than any of their neighbours. In reality, as a tourist, you will enjoy the highest level of hospitality from the local population as well as the local attractions. It is a country with the best tourism infrastructure in the region and after all, when visiting a developing country, this is what you should be looking at, not the political regimes. If you are looking for a holiday where you get to experience a real fusion of western and eastern cultures with a higher level of comfort, Azerbaijan would be up there on the list of places to visit. Additionally, Baku has a lot to offer besides the routine tourist attractions such as historical sites and museums, nicely described in this blog post. It is a vibrant city, especially in the summer months, bringing together many different cultures and customs. Offering a great variety of bustling restaurants and cafes as well as traditional and western lounges and clubs, a person of any age and interest can find something to fill their time with when visiting this city.